A book which attempts and succeeds at helping novice to advanced Greek New Testament students improve their reading and textual critical skills. I John : A General Reader, edited by J. Klay Harrison and Chad M. Foster, aims to target those finished with the basics of New Testament Greek and want to advance their skills — an area that is greatly lacking in resources and may be the source of why so many abandon Greek studies. I have been feeling that the whole realm of ancient Greek studies is in a woefully neglected state, greatly due to lack of demand and also that its methodology, and outdated teaching manuals, are putting it into the realm of obscurity and eccentrics. Then this comes across my desk and gives hope, opening the door for more to successfully study this genre. This is a good sign and a start of new things to come. This book is part of an ongoing series of books being published by GlossaHouse, a young publishing company founded for the purpose of helping “students and researchers advance in the language.” Their website is full of helpful materials focusing on the Greek language. It is clear that I John: A General Reader achieves this objective for mid-level students. It gives the necessary tools for the novice to make the jump into reading, understanding, and comprehending. It also sets the student up in working in the important realm of textual criticism. Textual criticism is not a bad word here. It merely is educating the student on an age-old system of notation which is a quick way of demonstrating differences in the Greek texts. The notation system seems a bit overwhelming at first but the book significantly helps develop awareness in this important aspect. It helps save a lot time in that you don’t have to go the manuscripts themselves to find these differences, they are already found for you, and you can make translation decisions in seconds rather than hours. It also help avoid having to read the many different Greek print styles, especially the handwritten ones – deciphering Greek calligraphy is a skill in itself, and is often a difficult process. Harrison and Foster softly but firmly introduce you into the world of reading, translating and analyzing ancient Greek texts in a meaningful and comprehensive way. The book itself is typed in a good-sized readable Greek font that is nicely set and spaced for easy reading. There are copious footnotes of almost every word, describing syntax, grammar, morphology and other nuances inside the context of I John. This allows the reader to move through the text at a rapid pace, learning new concepts on the way, and strengthening old ones. The General Reader can be used in a classroom, or as a self-study tool. 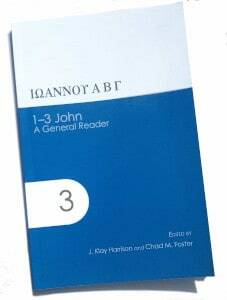 This is a must-have for those wishing to critically read 1-3 John in the original Greek. What would take the regular Greek reader hours in learning new vocabulary, analysis of variant textual manuscripts, grammar, and various textual problems, is reduced to a matter of minutes, if not seconds, by using this book. It is evident that lots of hard work and thought were put into this General Reader.